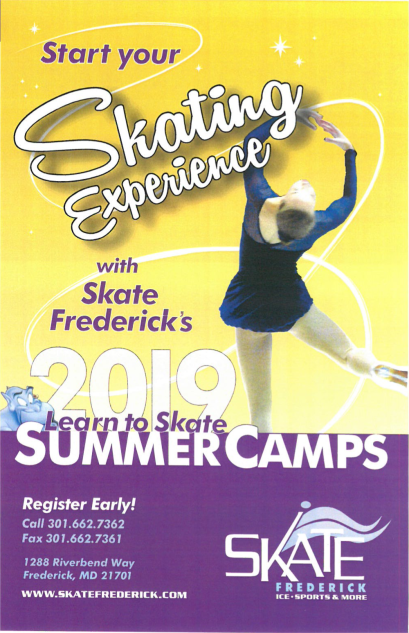 Skate Frederick camps are instructed by certified US Figure Skating, Learn to Skate USA, Professional Skater’s Association or USA Hockey instructors. This 3 day camp is designed for the beginner skater through Snowplow 3. Your child will make new friends and learn a skill that lasts a lifetime. He/she will be introduced to the basic skills of ice skating balance, off-ice stretches, a Thursday performance, and snacks will also be a part of this exciting opportunity for your 4 or 5 year old. Rental skates are included! This 5 day camp is designed for the beginner skater through Basic 4. It’s your chance to learn how to stroke, glide, and swizzle across the ice and stay cool at the same time. Our instructors incorporate games that make learning easy! Camp includes Friday performance, rental skates, and snacks. Perfect your forward and backwards crossovers while learning other figure skating skills skills. This camp will introduce skaters to jumps, spins, edges, synchronized skating and more. Learn off-ice training techniques and their benefits. Skating levels of Basic 5 through Freeskate 2. Camp includes daily snacks and rental skates. This week long training camp is back by popular demand for skaters Freeskate 3 and above , synchro skaters, and USFS Pre-Preliminary & above. Camp instruction includes: figures, power skating, jumps, spins, body position, off-ice stretches, and nutrition. Camp includes daily snacks. THE ACTION’S ON THE ICE….BE THERE!! !